Because taking photo is forbidden. So I borrow it from their official blog. I arrived the concert in time to see Wa-Suta opening act. They are going to perform Ran Ran Jidai their last song for this concert. After this Kanazawa Yuki made an announcement before the show and asked fans not to tease her about something. I learnt later in Tokyo Girls Update report that it may be her sweaty feet. I stood on the right side of FOH. Then overture song was played, the members got on the stage one by one to perform Star Shine Story which is the first song of this live. 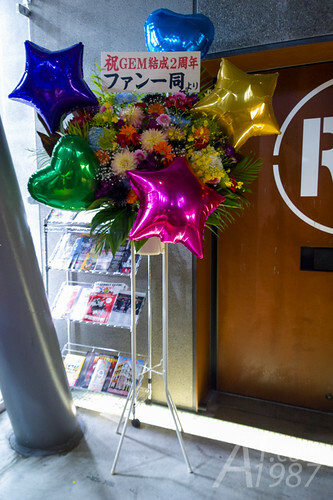 The set list consisted of their songs and iDOL Street songs. My favorite song Kitto for You! was performed in piano version and sang by Maaya and Chisarun. They are its original singers at the time they are with NAGOYA Chubu. The song that I didn’t expect to get a lot of attention is Do You Believe? While it doesn’t get much attention in my country. It’s very famous in Japanese fans so they had to perform this song again when do an encore. When this song is performed. The atmosphere is changed to dance floor and everybody enjoy it. Now it’s one of my favorite GEM’s track. In the last MC part of the live the group announce their target of perform their live at Nippon Budokan. Members said they will do their best to achieve it. Chisarun also said she hurts because her sister (Team Syachihoko’s Chiyu) performed the concert at Nippon Budokan before. So she will do her best to performed here too. A week later she left the group temporary to training for performing at Nippon Budokan. Concert ended. Many people were still in the lobby for using their drink coupon. 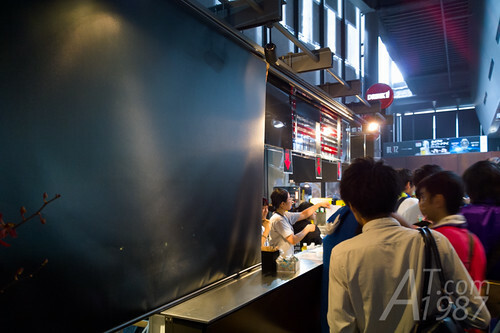 Most of drink menu are soft drinks which will be served in the plastic cup. The green tea and drinking water will be served in their bottle. After rested for a while. It’s time to take photos of flower bouquets around the lobby. I began with the one at the entry door. 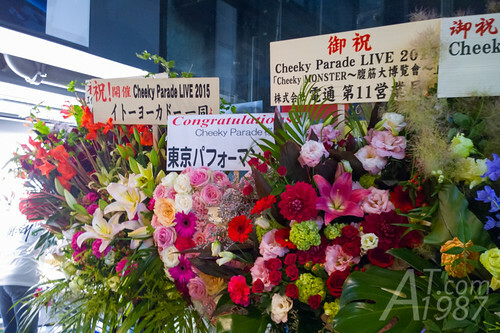 Cheeky Parade also held their concert at the Akasaka BLITZ. So their flower bouquets were here. One of them were from idol group Tokyo Performance Doll. 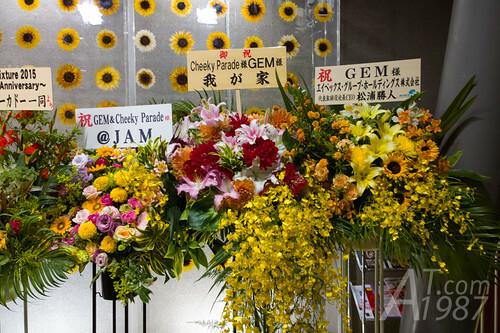 Avex Group CEO sent the flower bouquet to GEM too. At the exit Wa-Suta members and their manager sold their goods including the photo set I bought earlier. Too bad I didn’t have a chance to buy it from the members. 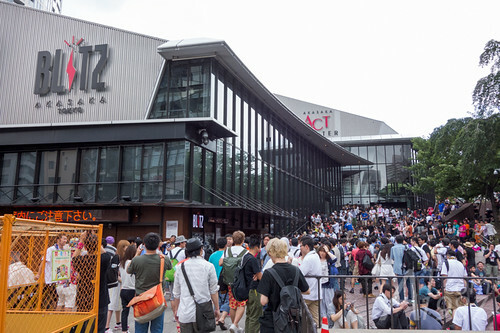 A lot of people were still outside the live house. They’re in the queue for Cheeky Parade concert. Since I had nothing to do here. I left the Akasaka BLITZ to Tokyo Station. I think GEM Live Mixture2015 ～2nd Anniversary～ is fun but it isn’t as fun as Ebichu’s concert I watch on the earlier day. Maybe it’s because the position I got where was almost behind the hall. 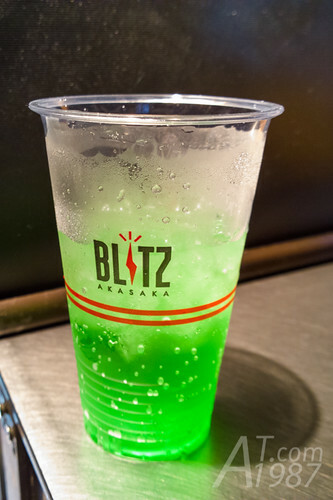 Although BLITZ isn’t a large hall and you can see the members perform clearly from afar. The view are blocked by the people in front of me. The old and small CCTV screen on the ceiling can’t help much. The other thing is the sound. I really like sound at the beginning of the concert. It’s very good but after the cheer sound from people is louder. It seems that the engineer push the volume higher to make the stage sound more audible. It ruins the good sound at the beginning. This also happened in Ebichu concert. So I think I should use ear plug next time. It’s too loud. Next time I will write about tea cafe in Harajuku. Please look forward to it.